The New Humanitarian | The climate loss and damage mechanism: whys and why nots? The climate loss and damage mechanism: whys and why nots? For poor countries "loss and damage" incurred as a result of a changing climate - with citizens being forced to relocate, give up on their land, cultural identity and their right to human dignity - are crucial issues. There is no agreed-upon definition for "loss and damage", but the phrase broadly refers to a range of harms incurred as a result of climate change, which cannot be avoided either through mitigation or adaptation. The issue became a major sticking point at the UN Framework Convention on Climate Change (UNFCCC) talks in Warsaw, which concluded on 23 November. IRIN takes a closer look. Why the fuss about "loss and damage"? There is a growing recognition among scientists that as the earth faces an unprecedented rate of warming, largely on account of human-related greenhouse gas emissions, we will be, or are already being, exposed to situations to which we would be unable to adjust or adapt. In Warsaw, Michel Jarraud, Secretary-General of the World Meteorological Organisation (WMO) reported that near the Philippines, "sea level rise over the last 30 years was probably of the order of three to four times bigger than it was globally… the annual rate… [globally has been] about 3 millimetres [to] 3.2 millimetres over the last 30 years, but in this part of the world it has been more like 12 millimetres a year". Because of the higher sea level, the damage in the Philippines in the aftermath of Haiyan "has been more than it would have been" a 100 years ago "under similar wind conditions". Working Group II of the Intergovernmental Panel on Climate Change (IPCC), which deals with adaptation, is expected to address "loss and damage" in its fifth assessment report in 2014. A campaign for recognition of "loss and damage" has been running since the 2007 Conference of the Parties (COP) to the UNFCCC in Bali. Low-lying islands and countries, mostly in the developing world, whose existence is threatened by rising sea levels and storm surges, have been lobbying for the creation of a loss and damage mechanism, separate from adaptation, under the COP. The mechanism would identify and promote efforts to address "loss and damage". The UNFCCC rests on two pillars. The first is mitigation, which seeks to reduce the sources of greenhouse gases, or to enhance the sinks that absorb these gases, such as forests. The second is adaptation, which is about the adjustments that humans, and ecological, social, or economic systems, make in response to actual or expected climatic changes. Both these pillars fall directly under the purview of the COP – which means a greater level of engagement by countries. Poor countries are looking for acknowledgement that adaptation will not work when the impact of a changing climate is already moving beyond the ability of people and systems to adapt. Placing "loss and damage" under the COP would signal acceptance that it is as important as adaptation and mitigation. Juan Hoffmaister, the Bolivian negotiator who drove the position of developing countries on "loss and damage" in Warsaw, noted in a 2012 paper he co-authored with academic Doreen Stabinsky, that a long-term drought in Mexico's northern state of Chihuahua had killed 350,000 head of cattle within 12 months. Maize production there had halved in 2011, prompting an official to ask, "Is it really a drought, or the region's new climate?" What was the issue in Warsaw? 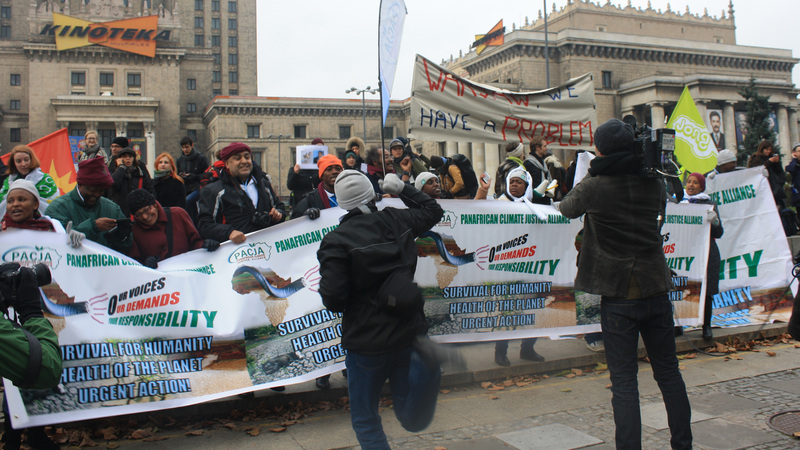 It was a victory for some of the world's most vulnerable countries when the 2012 COP in Doha agreed to set up a mechanism to address "loss and damage" at the 2013 COP in Warsaw. But the move to set up the mechanism developed into a tense stand-off between developed and developing countries, with rich countries like the US emphatic that "loss and damage" be placed under adaptation, saying that the responses to prevent or address "loss and damage" were similar to those for adaptation, such as disaster risk reduction. It was widely reported that the crux of the stand-off was because rich countries were concerned that making the "loss and damage" mechanism a separate pillar would eventually lead to a demand for compensation from the poor world. This was denied by Hoffmaister. In the end a mechanism for loss and damage associated with climate change impacts was negotiated in Warsaw, but developing countries had to settle for it being placed under adaptation. Does placing "loss and damage" under adaptation make a difference? "Can we just call it adaptation if people have to leave areas because they become largely uninhabitable [through drought]? What is the legal status of these people? ...we need to investigate the loss and damage beyond what can be adapted to, and figure out solutions"
This is a sore point for vulnerable countries. Nepal, the chair of the Least Developed Countries (LDCs) group, made a strong intervention in a session on the last day of the talks. Placing "loss and damage" directly under the COP would have given it "bigger political weight", says Sönke Kreft, leader of the international climate policy team at the NGO, Germanwatch. The acknowledgement that the "world has gone 'beyond adaptation' and entered an era of loss and damage" was needed, says Harjeet Singh, ActionAid's international coordinator for disaster risk reduction (DRR) and climate change adaptation. He thinks placing loss and damage under adaptation "might limit the scope of the mechanism to climate risk management", such as early warning systems in disaster risk reduction, which is not really going to help when your country faces extinction. But scientists like Richard Klein, a senior researcher at the Stockholm Environment Institute and an author of IPCC Working Group II reports, point out that "loss and damage" has been part of the 'adaptation agenda' since it was first acknowledged in the Cancun Adaptation Framework(CAF), which was adopted at the 2010 UNFCCC talks in Mexico. He thinks it would be "illogical" to keep it outside of adaptation. Besides, countries drawing up their adaptation plans would have to consider possible or unavoidable loss and damage, so it would be a better fit under the CAF, where it has been placed now. The CAF was a turning point. It fleshed out adaptation, provided guidelines on how to do it, and recognised "loss and damage". Klein says creating another UNFCCC pillar would be confusing. Talks on the proposed new climate treaty that is to come into effect in 2020 have already listed five pillars: mitigation, adaptation, finance, technology and transparency. "Adding a pillar on loss and damage would have set a precedent to turn everything that a group of countries feel strongly about into its own pillar. This kind of institutional fragmentation would be quite inefficient." Koko Warner, a scientist with the UN University and an IPCC Working Group II author, says the mechanism creates "a legitimate policy space" to discuss "what happens if what we are doing on mitigation and adaptation is not enough", and what do we do to help vulnerable people who are already feeling the negative consequences of climate change?" It will be critical for countries and communities already experiencing loss and damage whether this mechanism can contribute to new ways of a) viewing the climate change challenge, b) mobilizing resources and capacity to help these countries, and c) finding ways to prevent climate shocks from driving vulnerable areas even further from their development goals. Not all was lost for developing countries, who did get to "add a paragraph that not all loss and damage can be reduced through adaptation", says ActionAid's Singh. How do you distinguish an adaptation response from a response to address loss and damage? This is actually about drawing the lines around the limits of adaptation, about defining when adjustment to a situation can work, and the point where it no longer can. This will be a challenge for the new mechanism, says Sven Harmeling, the Climate Change Advocacy Coordinator for the NGO, CARE International. "If an island is drowning because of sea level rise… [and] people have to leave their entire homeland unwillingly, the term 'adaptation' is an unacceptable euphemism, in my view. "Can we just call it adaptation if people have to leave areas because they become largely uninhabitable [through drought]? What is the legal status of these people? ...we need to investigate the loss and damage beyond what can be adapted to, and figure out solutions. The underlying causes of such impacts are complex and often also involve elements beyond climate change." In an article in Nature Climate Change magazine, Klein, along with other scientists, recently wrote that many communities are already facing limits to their capacity to adapt, and suggested the development of a framework to define and identify these limits for individuals and for communities. "These limits are not only. [about] the rate or degree of climate change, but also include social, economic and cultural considerations", Klein tells IRIN. For instance, if a poor farmer has resources available, such as drought-tolerant seeds and access to information on how to conserve water, he/she will adapt. If not, the farmer will probably never be able to adapt, and will face losses. "The… [article] defines limits from the perspective of a specific actor facing the loss, be that an individual, community or region. This implies a level of subjectivity in determining limits, which adds to the challenge of attributing loss and damage to climate change," says Klein. Warner says some of the first steps for the mechanism would be to figure out what are appropriate responses to climatic shock. Would countries really have a better chance to claim for compensation if "loss and damage" was under the COP? It does not matter where loss and damage is placed, says Klein - proving liability is the bigger question. "One of the tricky aspects here is attribution, and. the difficulty of distinguishing between climate change and climate variability. But the extent to which loss and damage occurs also depends on a country's own level of preparedness. [Is]… loss and damage. 'beyond adaptation' if the country affected hasn't done all it could to reduce vulnerability… there is a domestic responsibility to avoiding loss and damage as well as an international responsibility… things [could get] quite ugly if the responsibility to avoid loss and damage, or to compensate for it, became a legal issue". Singh says "Instead of worrying about compensation and liability, rich nations must start delivering on their commitments to reduce emissions and provide support for adaptation to poor nations." How will "loss and damage" be financed? Compensation is going to be tricky. There will be a need to finance efforts to address loss and damage, but it is probably too early to talk about it. The text is weak on finance, says CARE's Harmeling. "Whether a separate fund would be needed, or whether existing institutions could play that role is another discussion to have. A better understanding of what are the solutions is more important for now." He hoped that "there will be a more intense discussion on financing arrangements which are based on the 'polluter pays principle', which is also applied in many domestic circumstances… overall it could help in building up a self-financing system, which also incentivises to pollute less."